You’ve heard of the Omaha Symphony’s Christmas show, right? It’s quite possibly the most anticipated show in the Omaha Symphony season – every year! This year, the “Physicians Mutual Omaha Symphony Christmas Celebration” will run for 10 performances this Saturday through Dec. 20 at the Holland Performing Arts Center. I’m bringing the kids to one of the shows for the first time! They’ve done really well at the Family Series concerts, so we’re taking it up another step for an all-out full evening performance. This isn’t any run-of-the-mill, ordinary concert, though. 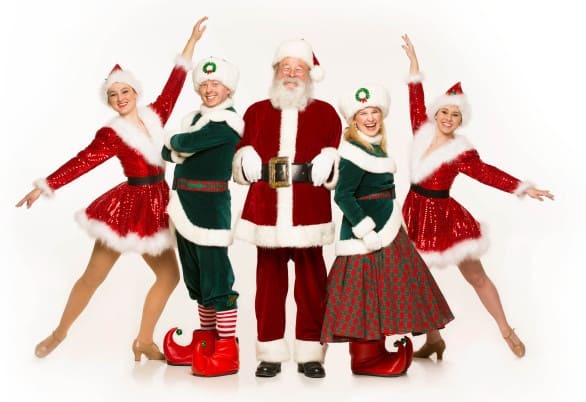 Along with the 68-piece orchestra, there will be Broadway singers and dancers, the famous dancing Santas, falling snow, a cute dog or two, and, wait for it…. flying reindeer. My kids are going to love it. Conducted by Resident Conductor Ernest Richardson, each performance will feature a carol sing-along, the show-stopping “O Holy Night,” and “Sleigh Ride” performed with the help of pint-sized audience members. New sequences include a “Downton Abbey”-style Christmas set in England circa 1919, which will feature elegant moments in a family’s celebration. In another highlight, a young boy searches for the magic of Christmas with his dog, while Santa seeks a child who still believes in the power of Christmas. This third story in the symphony’s recent “North Pole Trilogy” showcases the work of New York City puppeteer Eric Novak, who adds a polar bear this year to the symphony’s stable of handcrafted reindeer. I can just picture my kids’ reactions to all of this, can’t you? When: Dec. 12-20; performances are Saturday, Dec. 12, 2 and 7:30 p.m.; Sunday, Dec. 13, 2 p.m. and 7 p.m.; Thursday, Dec. 17, 7 p.m.; Friday, Dec. 18, 7:30 p.m.; Saturday, Dec. 19, 2 and 7:30 p.m.; and Sunday, Dec. 20, 2 and 7 p.m.
Tickets: Tickets start at $19 and can be purchased here. Student Rush tickets are $10 each and are available with a valid student ID starting one hour prior to the concert (may purcahse up to two Student Rush tickets). Tip: Pre-concert entertainment will take place in the lobbies prior to each performance, including the River City Ringers and the Immanuel Chime Choir, Nagosky’s violin students, the Heartland Youth Ballet, and reindeer from Kringle Stables outside in the Holland Center courtyard. Tip 2: You can bring a non-perishable food item to the Holland Center during to the show for the Food Bank for the Heartland to support ConAgra Foods’ Shine the Light on Hunger campaign. One reader is going to win a family 4-pack of tickets to the Friday, Dec. 18, 7:30 p.m. performance of “Christmas Celebration”! Use the Rafflecopter form below to enter. Must be 18 or older to enter. Not transferrable to another date or time. Disclaimer: I was provided complimentary tickets by Omaha Symphony to “Christmas Celebration” in exchange for promoting the performances. All opinions expressed are mine. Giveaway tickets are provided by Omaha Symphony. It sounds like a great event. We love the Omaha Symphony. The Facebook link for Omaha Symphony is missing the final “y”. Whoops. I’ll fix that. 🙂 Thanks! And now it’s really fixed. Sorry about that. The last Christmas song I listened to was O Holy Night! This sounds awesome! The last Christmas song I heard was Baby It’s Cold Outside. I have never been to the show, and would love to check it out! Oh, yes, the last holiday song I heard was ‘Donde Esta Santa Claus” by Augie Rios — it’s played often on the holiday music station I listen to. LOVE the symphony. They always do such a wonderful job. We are lucky to have them in Omaha. The last Christmas song that I listened to was “The Little Drummer Boy” with Bing Crosby and David Bowie singing. Michael Buble singing Rocking Around the Christmas Tree! Jingle Bells is the last one I listened to. It’s stuck in my head. My kids keep going on YouTube to sing a long Christmas songs to sing to. It’s cute for the first few songs. Then they fight over who gets to listen to what. Ha Silly kids! I just want to let you know that the link to visit Omaha Symphony’s FB page isn’t working. There will be dogs in the show! My kids LOVE dogs!